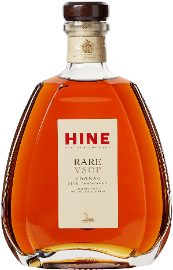 Hine Rare VSOP Fine Champagne Cognac: Fine Champagne means that it is a blend of over 25 Grande and Petite Champagne Cognacs, with at least 50% coming from Grande Champagne (not to be confused with the famous sparkling wine region, Champagne – a completely different place). The Rare VSOP Cognac is a blend of over 25 cognacs aged between 6 and 12 years, with the grapes sourced from Grande Champagne and Petite Champagne. The Blend is then further aged in French oak casks for 6 to 9 months, resulting in a very fine champagne cognac. APPEARANCE: Yellow gold amber colour and clear. NOSE: Notes of flowers and mixed fruits leading to spice and aromas of stone fruit, mingled with floral scents of jasmine. PALATE: Full of dried apricot and warm cinnamon, interwoven with ginger and sticky toffee. FINISH: Finishing dry and clean with lasting spice and fruit character. Mellow and smooth.